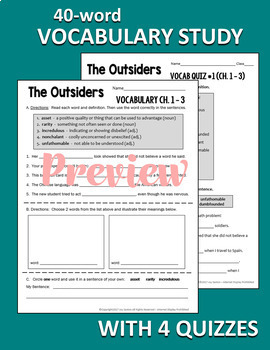 OUTSIDERS Vocabulary Study – Help students understand and acquire new vocabulary while reading S.E. 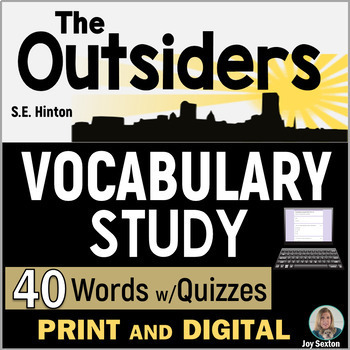 Hinton’s The Outsiders with this 40-word vocabulary study. Easy-to-use, no-prep handouts with definitions and practice help students understand word meanings before reading. Quizzes are included for quick assessment. 1. 40-WORD VOCABULARY STUDY STUDENT HANDOUTS – Eight pages, with definitions given, focus on 40 words in the novel. The words are grouped Ch. 1-3, 4-6, 7-9, and 10-12. Students study the words and definitions and then place the words correctly in sentences that are given. They also chose some words to illustrate meanings and use in original sentences. 2. VOCABULARY QUIZZES – 4 15-question quizzes are grouped into four sets of ten words (matching and fill-in-the-blank in a context sentence). Words reflect the sets of words on the vocabulary handouts. ANSWER KEY included. NOTE: This resource is part of my full Outsiders Novel Unit.